With more and more doctors and experts telling us to slather on a shotglass of sunscreen every two hours when at the beach to protect our skin, one must wonder, how much gets washed off in the ocean, and what is it doing to the environment? Plenty as it turns out. 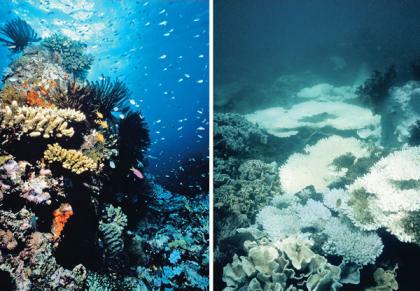 There has been major damage to coral reefs (many snorkel and dive destinations now ban the use of sunscreen), sea creatures, even natural freshwater pools in Hawaii. So what is one to do? Easy, cover up. The oldest and most tried and true method to escape the sun is to seek shade, wear a wide brimmed hat or light, loosely fit clothing which can shade you from the sun and keep you cool at the same time. If you simply must use sunscreen, use a coral reef safe brand or sunscreens with physical filters (like zinc oxide and titanium), which reflect instead of absorb ultraviolet radiation, and use eco-friendly chemical sunscreens. 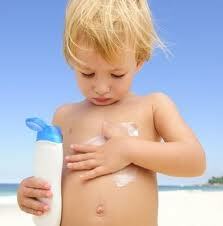 It takes only 20 minutes in the water before a quarter of your sunscreen washes off. Researchers estimate that 4,000 to 6,000 metric tons of sunscreen wash off swimmers annually in oceans worldwide, and that up to 10 percent of coral reefs are threatened by sunscreen-induced bleaching. These ingredients may be linked to ‘coral bleaching’ by activating dormant viruses in the colorful symbiotic algae called zooxanthellae. Zooxanthellae are colorful algae which live within the coral and use photosynthesis (like plants) to feed the coral. These chemicals found in sunscreen cause the viruses to replicate and grow until bursting and killing the algae, leaving the coral ‘bleached’ white and dead. These ‘activated’ viruses then spread, infecting and killing neighboring coral communities. So for that day of fun and sun at the beach, let’s save some coral and our skin by just covering up, and if we must use sunscreen, pick some eco-friendly and reef safe sunscreen. Do you have any idea if these eco-friendly sunscreens that are coming out nowadays have some components that are harmful to human skin but not really destructive to reefs?